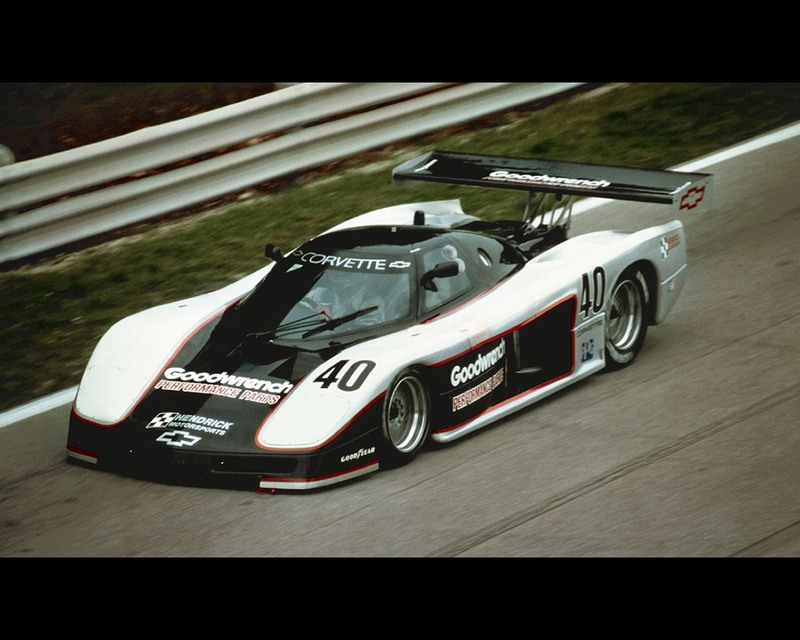 The Chevrolet Corvette GTP of Hendrick Racing, in 1986, won at Road Atlanta 500 Km as well as at West Palm Beach 5 Hours. It accumulated several pole position during its racing career. 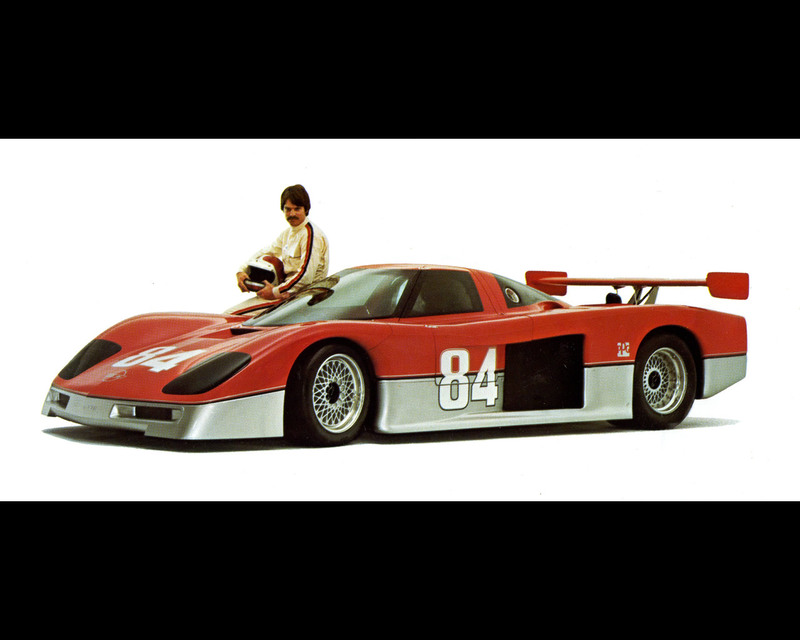 The IMSA GTP series started in 1981 with the Championship title for Brian Redman on a Lola T600. The Chevrolet Division of General Motors decided to participate in this endurance racing series in USA and Canada. 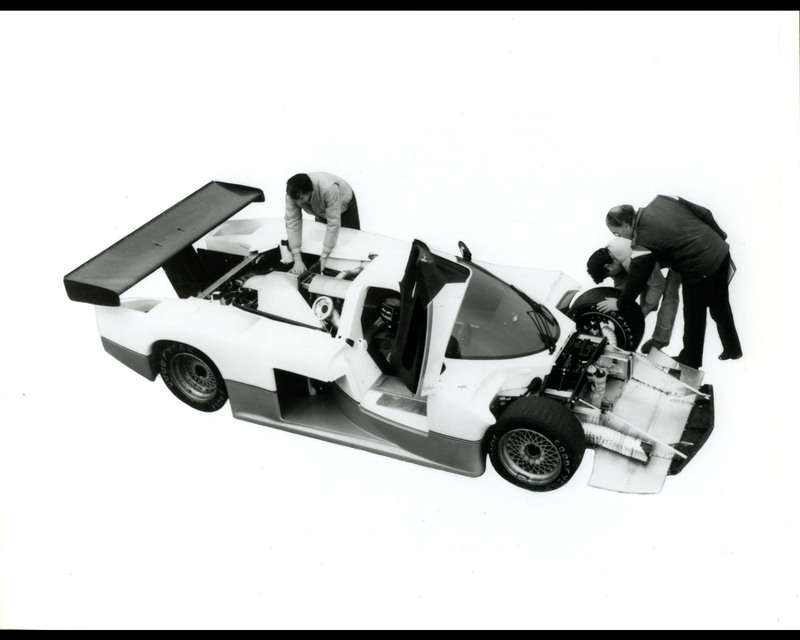 Lola and March were specialists for the preparation of GTP chassis-body units. 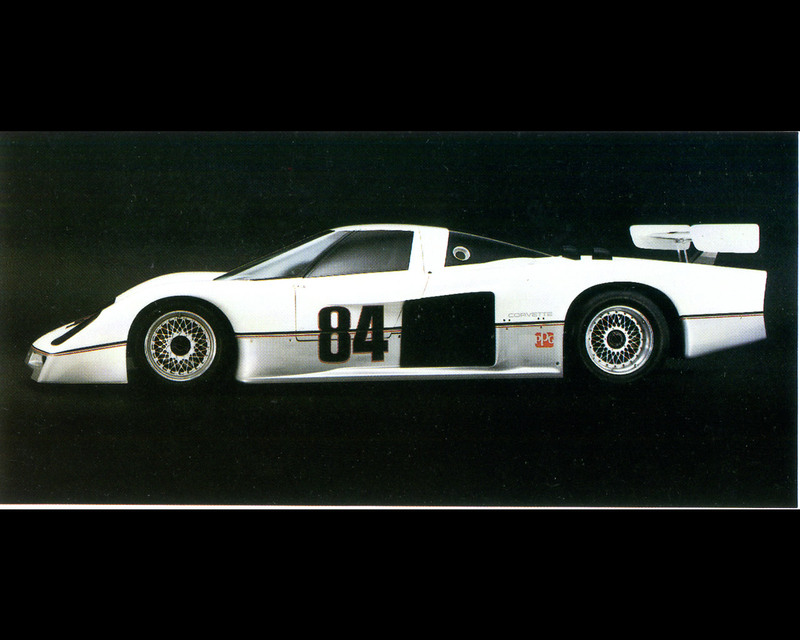 Chevrolet contracted Lola for its GTP. Jerry Palmer from the GM Styling was involved in preparing a body shape that would recall the famous Corvette and refining the project in wind tunnel. 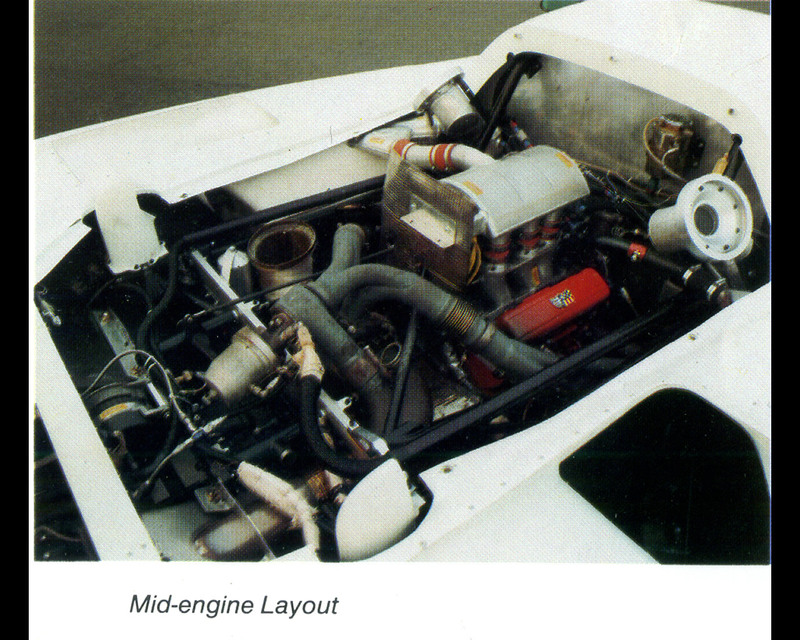 The Hendrick Racing team operated a Corvette GTP fitted with a turbocharged V6 Chevy engine while the Peerless Racing team operated a Corvette GTP with a prepared Chevy V8 engine. 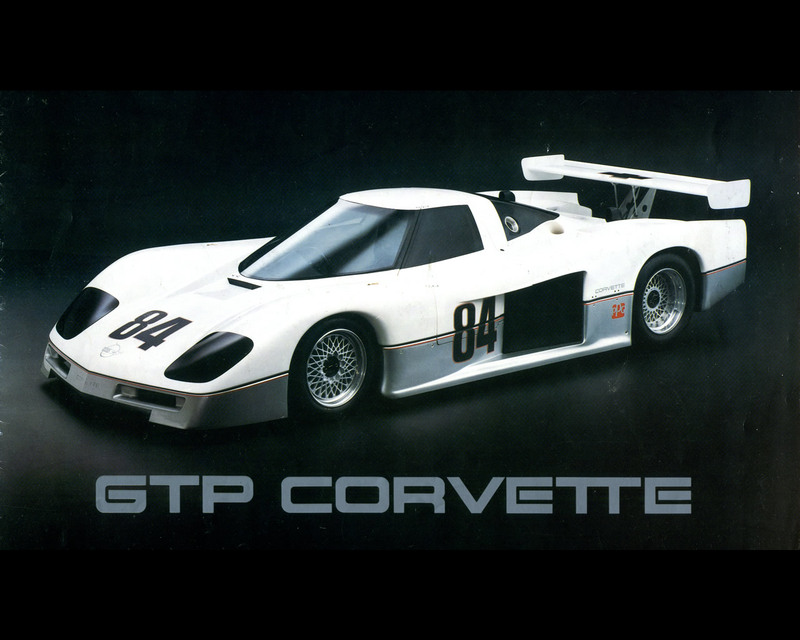 Here is the description proposed in the 1985 Chevrolet Technology Introduction Leaflet for the Chevrolet Corvette GTP. We have reproduced most illustrations in this Car Reviews. Not many international motorsports venues offer the machinery evaluation potential of IMSA’s GTP series. Chevrolet‘s GTP Corvette – a purpose-built mid-engine racing machine with a clear-cut relationship to street production Corvettes- is designed to compete in IMSA as well as FIA Group C endurance contest around the world. The objective is two-fold: 1) Further development of Chevrolet’s 90-degree V6 engine technology, and , 2) Enhance an international performance reputation that extends back to the 1950s. Herb Fishel then Manager High Performance Operations at Chevrolet Motor Division declared at the time “To us, the competitive environment offered by motorsports goes far beyond entertainment. “It offers an unparallel opportunity to evaluate our machinery… our technology…in a setting which is impossible to duplicate. “Our intent is to turn the knowledge gained through on-track experience into viable applications for our production cars and trucks. Fabricated in the shops of Eric Broadley’s famed Lola Cars Ltd., Huntington, England, the GTP Corvette carries the Lola T-710 designation. It’s a brand new design based on Broadley’s highly regarded T-600 chassis… another recent winner on the IMSA circuit. The turbo V6 Chevrolet powerplant is an integral part of the car’s structure. It is mounted between a quarter inch aluminium plate at the firewall and the transaxle housing at the rear. The engine and tubular steel triangles at each side are major frame elements. As load-bearing members, they contribute to the torsional rigidity of the car. Forward of the firewall, a monocoque structure made of aluminium panels, sandwiching a lightweight expanded aluminium honeycomb, carries the load. A 32 gallon fuel tank located ahead of the engine is isolated from the cockpit by a firewall. Dual remote fuel pumps are mounted in the side sills of the monocoque. A tubular steel roll cage is bolted directly to the top surfaces of the monocoque. Suspension components are carried by machined aluminium cross members, two at the front and one at the rear. The front suspension system is an advanced pushrod design with twin steel wishbones pivoting to magnesium hub carriers. These hubs are sprung with constant-rate steel coils, concentric with adjustable gas-pressurized shock absorbers. Mounted vertically near the centre of the frame, the springs are operated by rocker arms and pushrods from the lower wishbones. Integrated with each rocker and linked to each other are two high-tensile steel blades. When both wheels rise or fall together this twin-blade system moves freely. But when the car rolls in a turn, the blades flex, exerting an anti-roll effect similar to a stabilizer bar. The degree of anti-roll may be varied by a driver-controlled lever in the cockpit to alter the angular position of one or both blades. A rack-and-pinion steering gear is mounted high behind the front cross member and connects to fabricated steel steering arms. At the rear, a similar twin-blade anti-roll system is integrated with the upper wishbones. Again, the effect can be changed by driver control. Wheel-mounted disc brakes have 13-inch rotors front and rear. They are internally vented for cooling. Separate master cylinders for front and rear circuits are operated by a balance bar from the brake pedal. Front tires are Goodyear 23.5x 11s mounted on 16-inch magnesium wheels. Rear tires are Goodyear 27.0x 14s on 16-inch wheels. All tires have safety liners in case of puncture. In racing, aerodynamics constitutes a paradox. The same shape designed to offer minimum aerodynamic resistance must offer maximum down-force potential. 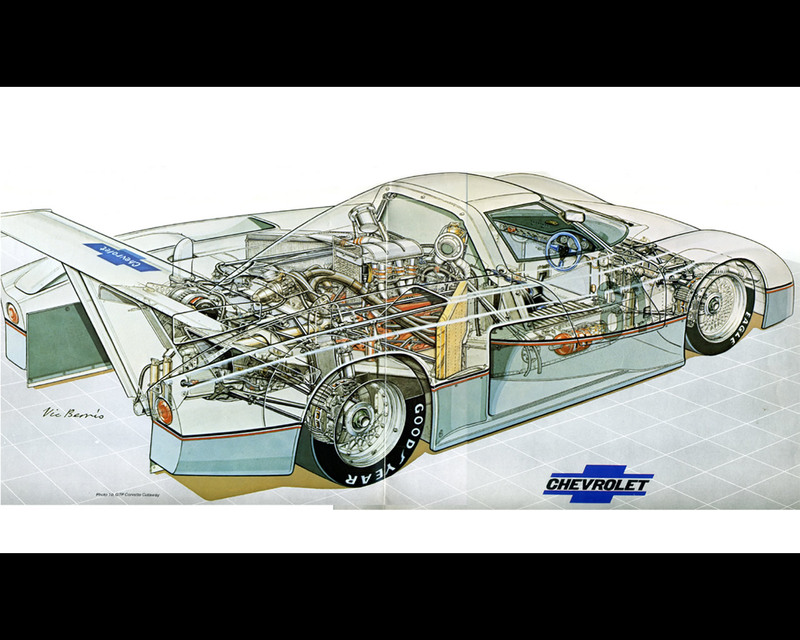 The GTP Corvette features a fully enclosed under-body and meets the mandatory Group C Prototype flat-bottom area of 32 x 40 inches. A venturi rising from the under-body between the rear wheels creates a low-pressure area which acts to press the car against the track surface. The GTP Corvette is designed to produce nearly twice as much down-force as other Lola-based designs. Openings in the upper body are minimal. Two snorkels are attached to the tops of the rear suspension uprights for rear brake cooling. A duct system below the headlights cools the front brakes. Large main air inlets on each side just ahead of the rear wheels serve different functions. The right-side inlet feeds the single large engine radiator and transaxle oil cooler. The left-side inlet feeds air to the turbocharger intercooler and to the engine oil cooler. Apertures on both sides deliver air directly into the engine bay. Body panels of high-strength Kevlar fabric bonded with epoxy resin- one of the strongest, lightest combination of material known – are thinner and lighter than customary because they are backed by a sheet of unidirectional carbon filaments. Such panels provide needed stability under the high-heat load conditions typical of turbocharged cars. For areas of even higher stress, like the rear wing carrier plates, an aluminium honeycomb core is wrapped in both Kevlar and a carbon filament weaves. The wing is a stressed-skin self supporting structure that provides additional aerodynamic down-force. Entry into the GTP Corvette is through doors that hinge up and forward. The driver’s seat is on the right side, best suited to the layout and direction of most race circuits. 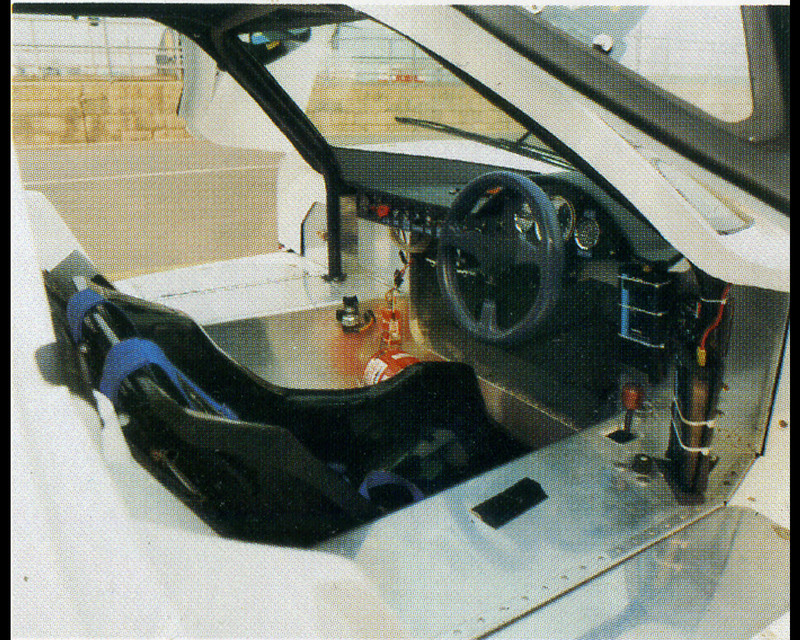 A special feature of the GTP’s chassis is a wide foot-well designed to make the driver as comfortable as possible during the hours required to complete a long-distance endurance race. Location and angle of the steering column provide an ideal driver-to-wheel relationship. For responsiveness, lock-to-lock steering requires 1.75 turns of the wheel. To suit different drivers, the brake, clutch and accelerator pedals have adjustable mounts. A six-point seat/shoulder harness secures the driver to a permanently fixed seat. Forward and side visibility are excellent due to the large wraparound windshield and side windows. Rearward vision is limited to use of outside door-mounted mirrors. Oil pressure, oil temperature, fuel pressure and water temperature gages, plus a tachometer, are located directly ahead of the driver. The manifold pressure gauge, front/rear brake balance and turbo boost controls are mounted on the door sill along with the shift lever. Front and rear anti-roll controls are visible below the dash on the driver’s left. Switches for items as ignition, starter, headlights and fire extinguisher line are on the left side of the instrument panel. The 90-degree V6 engine nestled between the rear wheels of the GTP Corvette owes a considerable amount of its character to Chevy’s venerable small-block V8. Many components, including valves, rocker arms, pistons and flywheel, are interchangeable. Although differences between production and race engines are considerable, the V6 incorporates as many off-the-shelf components as possible rather than expensive and exotic designs so often found in racing. The GTP’s heavy-duty cast-iron V6 cylinder block is an adaptation of the 90-degree design found in many GM cars and trucks. Ryan Falconer Racing Engines of Salinas, CA, whose Can-Am, IMSA and Indy Car engines are so highly regarded, is the engine builder. Early in the program it was determined that the V6 would be turbocharged in order to achieve a power output at least comparable to Falconer’s normally inspired aspirated Chevy V8s. The smallest 90-degree Chevrolet V6 in current production displaces 229 cubic inches. Since IMSA GTP rules for stock-block V6 turbos allow only 209 cubic inches, piston stroke was reduced to 2.75 inches (from 3.48) and bore was increased to 4.00 inches (from 3.74). This over-square configuration provides greater durability and the development of more usable power through a very wide rpm range. The billet steel crankshaft is a common journal design like the V8 engines. Special V6 connecting rods are billet-steel, hand-polished and shot-peened like the rods in Chevy’s famous L88 big-block V8. Cylinder heads are one-piece cast aluminium and feature full water jackets. Evenly spaced intake and exhaust ports, much like the Chevy L88 design, are well-suited for turbo applications. A compact Warner-Ishi Model RX9-L turbocharger is mounted to the rear of the engine, where it can be cooled by ambient air ducted into the engine compartment. An air-to-air intercooler reduces inlet air temperature from about 300°F to a more desirable 100°F level when the turbo is running at the maximum 20 psi boost. A high-pressure pump feeds racing fuel to a multi-port injection system. To maintain a low engine profile, a dry-sump lubrication system is used. Dynamometer tests have shown the engine capable of producing up to 775 horsepower at 8.500 rpm with full 20 psi boost. Torque ratings are typically 556 lbs.-ft at 7.000 rpm. Width, height and dressed weight of the turbo V6 are much the same as those for a naturally aspirated V8. The V6 is 4.4 inches shorter, so it rides farther forward of the transaxle. The engine is located for optimum weight distribution. A Hewland Type VG transaxle provides five forward speeds and reverse, with a ring-and-pinion ratio of 3.1:1. These constant mesh gears can be changed for optimum track requirements through the rear of the housing.